Rome is my very favorite city; it’s a vibrant, lively city filled with rich history. One of the things I love about Rome is you don’t have to “go see the sights,” because the sights surround you. You’ll be amazed at the ancient landmarks you will come across simply walking the city by foot. Rome is a museum alive, all around you, showcasing the ancient architecture, cobblestone streets and fountains from an ancient civilization that existed centuries ago. Among the well preserved landmarks, exists a contemporary lifestyle filled with a lively night life, designer shopping outlets, fine dining and cafes. Don't be surprised when a leisurely stroll leads you past a building as grand as this; the Supreme Court of Cassation. Rome radiates an energy unlike any other city I've been. It's a bustling, lively city, yet the lifestyle is slow, laid back and easy going. People are not rushing about, they take their time with every activity, starting with their morning coffee. You won't find coffee to-go here, or even a Starbucks. Each morning, locals enjoy their cappuccino or espresso in leisurely manner at a nearby cafe. The same goes for their afternoon coffee break. They don't bring coffee back to the office, they take the 10-15 minutes and enjoy. I'll never forget the strange look I got the first time I ordered my morning coffee to-go and the barista sent me off with a doubled up plastic cup that pretty much melted (as I said, they do not have t-go cups)...lesson learned. Do as the locals do and relax and enjoy your morning coffee on-site at a nearby cafe. Besides the laid back lifestyle, the best part about Rome is that you don’t have to go far or plan much to take in the living history. Simply immerse yourself in the city, doing whatever it is you love; from museums, to photography, to dining, shopping, taking a stroll through the cobbled alleyways, renting a scooter, enjoying a street performance, chatting with a local or grabbing a glass of wine in one of the many historic piazzas. You will love the juxtaposition of enjoying modern day life with an ancient city as your backdrop. Enjoy a glass of wine along with some meats and cheeses in one of the many piazzas throughout the city. Doing a walking food tour or shopping tour is a great way to begin your sightseeing adventure and get a feel for how the city is laid out. Don’t be surprised when you stumble upon the centrally located Spanish Steps or Trevi Fountain along the way. For high end shopping, Via dei Condotti is a must-see featuring designer stores such as Gucci, Prada, Ferragamo, Bulgari, and Louis Vuitton. With so much to see and do in one of my favorite cities, it was extremely tough narrowing down my 3 “Must Eat” and “Must See”. Designer shops now line the streets leading up to the iconic Spanish Steps. The Colosseum: You may think of Russell Crowe in the Gladiator when you think of the Colosseum, but the reality is, this wasn’t just a backdrop to an action flick. It was here that real life gladiators and wild animals once fought to-the-death battles as Roman emperors and the general public watched on as spectators. The moment you step into the Colosseum, you are thrown back in time and its grand nature will leave you awestruck. Rather than exploring the landmark on your own, I suggest Rick Steves free audio tour which can be downloaded using his app. Be sure to buy your tickets for the Colosseum in advance to avoid excruciating long wait times. The Colosseum had seating for over 50,000 spectators who were seated in order of social class. Roman Basilicas: With over 900 churches throughout the city, it is worth your time to tour a few of the most important churches within the city, known as basilicas. A basilica is simply an important church designated by the pope because they carry special spiritual, historical, and/or architectural significance. In Rome, there are four major basilicas, Basilica of Saint Paul, Basilica di Santa Maria Maggiore, Basilica of St. John Lateran and St. Peter's (located in Vatican City). I recommend a guided tour of one, or all three so you can really understand the history and story behind each basilica. Basilica Santa Maria Maggiore contains pieces of ancient wood which tradition holds to be part of the manger where the Baby Jesus was laid. Outside the Vatican after Pope Francis's first public blessing. Palatium: If you’re looking for local, look no further than Palatium. The restaurant is run by the Lazio Regional Food Authority, meaning all of the ingredients are sourced from farms in the Lazio region just a short distance southeast of Rome, so you’re always getting fresh, seasonal plates. The menu is ever-changing, but always features Roman classics with Palatium’s own twist. 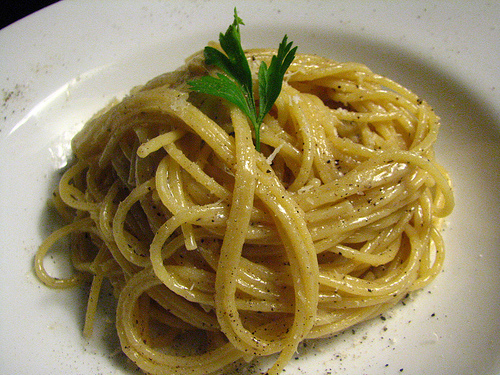 Cacio e Pepe: The name of this yummy restaurant coincides with a staple dish in Italy. The ingredients seem simple, pasta with black pepper and cheese, but the dish is out of this world and the Carbonara is also a must-try! Cacio e Pepe, a traditional Italian dish. Come il Latte: If you have high expectations for good gelato in Italy (a must while you sight-see), this place will exceed them. The gelateria’s name, meaning “Like Milk” hints at one of this decadent gelato’s main ingredients; fresh cream. Come il Latte features all the traditional flavors, while also offering fresh new creative flavors such as pineapple and basil and ricotta with Sambuco. Whether you go the classic or the creative route, this place won’t disappoint! Travel Tip: If you’re looking for authentic gelato, avoid the places with huge mounds pretty, puffy, colorful clouds of gelato. The fluffiness comes from artificial thickeners, rather than natural ingredients.